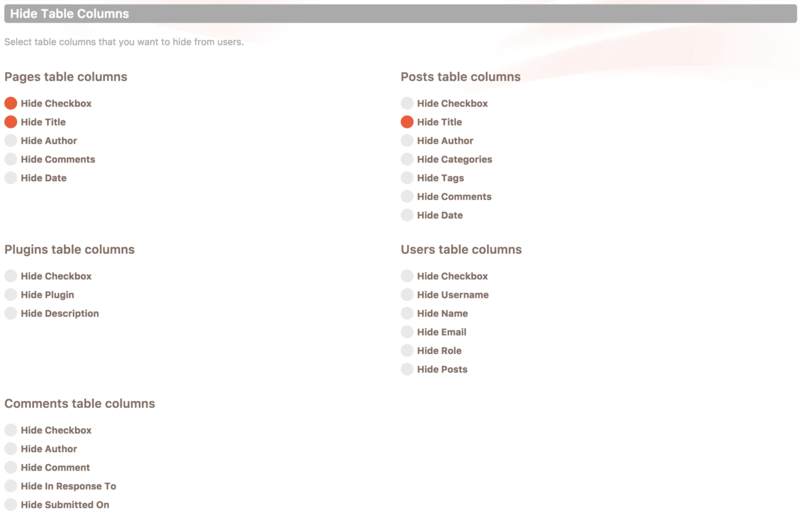 WordPress has many tables in admin panel where you can see the data and edit and delete items. In many cases, you would want to hide some of the columns from your users to make it cleaner to use and maybe to hide some data from your users that they don't need or should not be able to see. Cusmin gives you the ability to hide all columns from these tables that you don't need. Some of these tables are Posts, Pages, Users, Plugins, Comments and in many cases you should be able to manage tables created by other plugins. Authors of these plugins would need to follow the WordPress way to create custom post types in order for you to see those tables here.